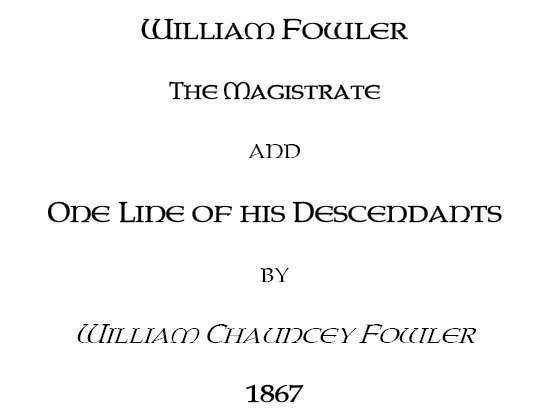 A small book titled, "William Fowler, the Magistrate, and one line of his Descendants," by William Chauncey Fowler, Historic Genealogy Society, 1867. 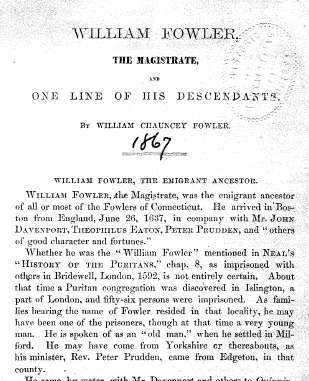 It is a genealogy on one line of the family of William Fowler an emigrant to Connecticut in 1637. Please note: This is not a paper book, it is a scan of the original paper book into the digital Adobe PDF format, written on a CD-ROM. 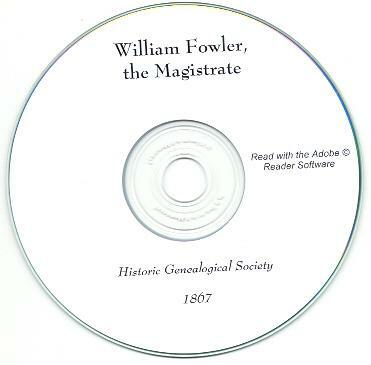 You read this book on your computer using the free Adobe Reader software. It is a digital version of a hard to find book. 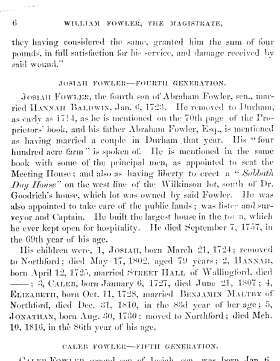 Anacouset, Ansantawae, Anshuta, John Astwood, Hannah Baldwin, Elizabeth Bartlett, George Bartlett, _____Bird, Alexander Bryan, Thomas Buckingham, _____ Burnham, Francis Bushnell, John Caffinch, Deacon Chapmen, Catherine Chauncey, Elnathan Chauncey, John Davenport, Theophilus Eaton, Aaron Elliott, Abigail Fowler, Abraham Fowler, Ambrose Fowler, Amos Fowler, Anna Fowler, Caleb Fowler, Catherine Worthington Fowler, Charles Augustus Fowler, Daniel Fowler, Ebenezer Fowler, Eliza Ann Fowler, Elizabeth Fowler, Hannah Fowler, Irene Fowler, James Fowler, John Fowler, Jonathan Fowler, Josiah Fowler, Julius Fowler, Lucretia Fowler, Mary Fowler, Mehetabel Fowler, Ozias Fowler, Pamela Fowler, Reuben Rose Fowler, William Fowler, William Chauncey Fowler, Abraham Fowler, Jr., John Fowler, Jr., Josiah Fowler, Jr., William Fowler, Jr., Thomas Fugil, Stephen Goodyear, Thomas Gregson, Street Hall, Joseph Winborn Hand, Samuel Hopson, George Hubbard, Mary Hubbard, William Johnson, Pelatiah Leete, John Lord, Benjamin Maltby, Manataque, Richard Miles, _____ Mulford, Josiah Parmelee, Peter Prudden, Thurston Raynor, Anna Rose, Billy Rose, Cloe Rose, Daniel Rose, David Rose, Hannah Rose, Jacob Rose, John Rose, Jonathan Rose, Lucy Rose, Mary Rose, Nathan Rose, Rebecca Rose, Reuben Rose, Robert Rose, Samuel Rose, Sarah Rose, Robert Rose, Jr., Edmund Tapp, Nathaniel Thayer, Andrew Ward, Thomas Welch, Zachariah Whitman, & George I. Wood.